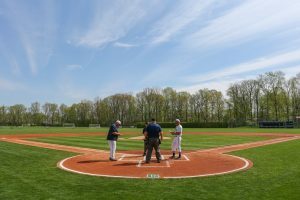 Covenant Warriors Baseball began in the spring of 2000 and for the first three seasons, played with no on-campus field. Long-time baseball player and Covenant parent Scott Dobbs was stricken with cancer in the spring of 2002. When Scott lost his battle with cancer that fall, his family knew that one of his desires was to see Covenant have their own baseball facility. Scott knew this was necessary for the program to grow and succeed. After his death, his family orchestrated a memorial fund to see that dream become a reality. Construction on what is now Warrior Park began in the spring of 2003 with the funds generated from the Dobbs Memorial Fund and gifts from the Dobbs family. Warrior Park is one of the premier and most unique high school baseball facilities in the area. It is the home of the Covenant baseball program as well as a facility used by several outside baseball teams, P.E. classes and soccer practices. Warrior Park regularly hosts over 200 events each year. At first sight, the dimensions of the playing field are quite peculiar to say the least. The field layout was designed with several things in mind. First of all, there was a goal of both uniqueness and nostalgia. Several professional baseball stadiums, both past and present, were used as models to aid in the designing of this new facility. The dimensions from Boston’s Fenway Park were flipped backwards, placing the big wall, which has become known as the “Screen Monster”?? in right field instead of left. 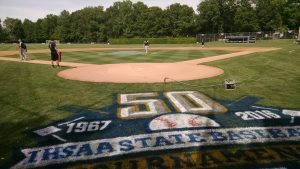 Some other minor modifications to the dimensions were also necessary in order to allow enough room for a secondary soccer field to fit into the outfield space. In order to do this, the right centerfield gap is 9’ deeper in Warrior Park than in Fenway Park, and most of the left field fence is removable for during soccer play. Also, the deepest part of the field (just left of dead center, 400’) is 20’shorter than at Fenway Park’s “Triangle”. The playing field itself was built by volunteers and parent contractors. The turf is a blend of Kentucky bluegrass and perennial ryegrass, with a fully automated irrigation system. The infield skin has been renovated several times over the years, but has led to Warrior Park having a top-of-the-line infield surface. The skin is made up of approximately 60% sand and 40% silt/clay, with a silt/clay ratio of .86. The seating bowl for this facility also has a story of its own. All of the iron legs of the sixty individual seats were originally installed in a facility in St. Louis for the 1904 World’s Fair. In the last few years, Archer Seating (a company that specializes in old stadium seats) removed and restored them. All of the seats and seat backs have been replaced with plastic that was in Camden Yards (home of the Baltimore Orioles) from 1992-2002. Most of these seats have been purchased by family and friends of Covenant, as a means to honor a friend or family member. Other unique touches that have been added to Warrior Park are, full brick dugouts, euonymus vines to cover the fence in centerfield, a 40’ manually operated scoreboard built into the right field fence, landscaping and trees. Future athletic facilities expansion ideas may look at converting Warrior Park to a softball facility and develop a new baseball facility across 21st Street.